How on Earth did we not hear about this coming up? Well thanks to The Nerdist we did — and just in time too, as the newly-animated Watership Down is due very soon! 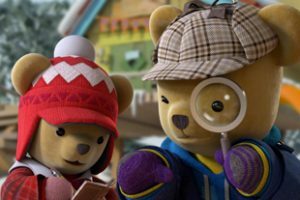 “The BBC and Netflix are releasing a new CG-animated version this Christmas, and in order to more accurately portray the book, it’s going to come in two feature-length installments. 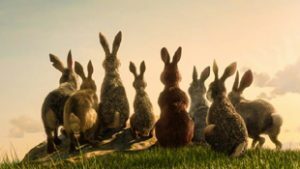 The cast was already all-star, with James McAvoy as refugee rabbit leader Hazel, Nicholas Hoult as the psychic runt Fiver, John Boyega as the intimidating fighter Bigwig, Olivia Colman as bereaved doe Strawberry (a gender-flip from the book), Ben Kingsley as villain General Woundwort, Tom Wilkinson as doomed elder Threarah, and Taron Egerton as the rabbit Christ-analogue El-ahrairah (meaning “prince with a thousand enemies”). But now, via an official BBC announcement, they’ve revealed even more: Peter Capaldi will play the bunnies’ seagull ally Kehaar, Daniel Kaluuya is warren destruction survivor Bluebell, and Rosamund Pike is the Black Rabbit of Inle, a death/Satan figure and counterpart to the rabbit deity Frith.” All that plus director Noam Murro, the man behind 300: Rise of an Empire. Look for it on Netflix this coming December. 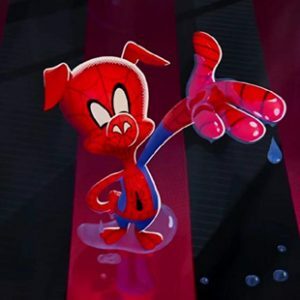 Alexander Henderson is head of a team of animators and film-makers with experience working for Disney, Netflix, and Amazon. Their first completed short film is called Breathing Space, which you can find on YouTube — and which just happens to have some anthropomorphic interest in it too! Now they’ve created a Kickstarter campaign to help finance their new film concept. 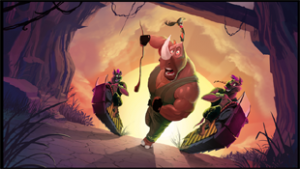 “The Rhino and the Oxpecker is an action-adventure cartoon, featuring the story of Niles, a blind mercenary rhinoceros, and Redford, his neurotic-but-trusty guide bird. With Red acting as the eyes, ears, and brains of the duo, and Niles handling the action, the two work together to survive predators, poachers, and anything else the jungle can throw at them. That is, provided they can survive each other.” They’re trying to reach their current goal before Halloween, so hurry! 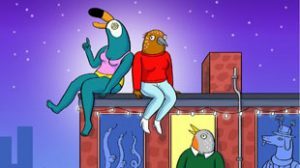 We actually heard about this from several sources: Tuca & Bertie is a new 2D animated series coming soon to Netflix. 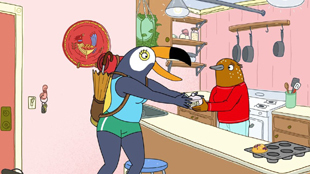 It stars comedian Tiffany Haddish (Girls Trip) as Tuca, “a cocky, care-free toucan who’s friends with a 30-something and anxious songbird (the titular Bertie)”. Ms. Haddish is also executive producer on the show, which was created by BoJack Horseman producer and designer Lisa Hanawalt. AV Club has more information about it, but no premier date yet. In case you haven’t caught word of it yet: Trollhunters, created by none other than Guillermo Del Toro for Dreamworks TV and Netflix, is coming off a very successful and award-winning year. 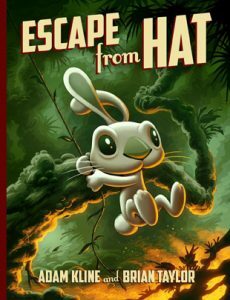 Now Dark Horse Comics have announced a new full-color tie-in graphic novel. 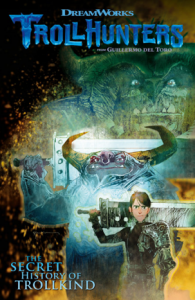 Trollhunters: The Secret History of Trollkind is written by Richard Hamilton and Marc Guggenheim with art by Timothy Green II and Wes Dzioba. “Trollhunters: The Secret History of Trollkind explores Jim’s journey as the first human Trollhunter — defender of good trolls. The secrets of the great troll warriors of the past are crucial tools for the new Trollhunter, and the time has come for Jim to appreciate the battles of Kanjigar the Courageous, who through his own struggles, triumphs, and failures lead the trolls after the Battle of Killahead Bridge through unknown territory, across oceans and continents, and past fearsome foes! With his friends by his side, Jim continues the fight against the Gumm-Gumms and their allies!” SyFy Wire has a detailed article about it. Look for it this February. Took ’em a while, but Dreamworks have finally brought us more adventures with Spirit, star of the 2002 2D animated feature Spirit: Stallion of the Cimarron. 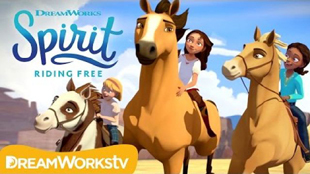 Animation Scoop has a recent article introducing us to Spirit Riding Free, a new DreamworksTV animated series coming to NetFlix on May 5th. The story and characters are considerably different from the animated feature this time around: “When city-turned-country girl Lucky meets a wild mustang named Spirit, she feels an instant connection to the untamable horse. A courageous and natural-born leader, Lucky navigates this new world with her two new best friends, Pru and Abigail by her side. The trio embark on thrilling adventures, find genuine friendship, and discover what it means to be free!” No sign of Matt Damon to be found. Anyway, visit the article to see a trailer for the series.